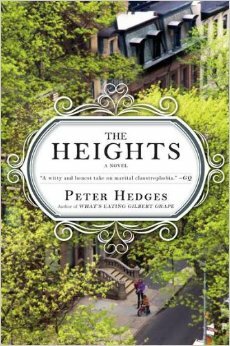 The Heights caught my attention primarily for its cover. One cannot underestimate the power of a beautiful book cover! Other than author familiarity, the cover (including the spine) is the thing that sparks curiosity about the content. On the cover were the second and third things that caught my interest – the short teaser “A witty and honest take on marital claustrophobia” and a tiny blurb underneath the writer’s name, “author of What’s Eating Gilbert Grape.” Then I learned that Peter Hedges wrote the screenplays for About a Boy and Dan in Real Life, and then I was sold. The Heights is about Kate and Tim, a happy and settled couple living in a tiny apartment in one of the most desirable neighborhoods in Brooklyn. Tim is a history teacher at a private high school and Kate stays home with their two young boys. Unable to make all the ends meet, Kate lands a high-paying job that enables she and Tim to swap roles. It sounds like this swap spurs conflict, but it doesn’t. They are a team, so no matter who earns the money and who stays with the kids, contentment and security is the only concern. It’s Anna who causes the upheaval. Anna, with her perfect skin and fat wallet and dynamic new apartment in the neighborhood. She seems desirable in every way, and though everyone knows there’s something off about her, Kate and Tim don’t see it until they are too intertwined in Anna’s magnetic world. What follows is a test for Kate and Tim’s marriage, the entrance of a wealthy old flame, and the temptation to dip a toe in the life of extravagance. By the end of the book, they get their answer.